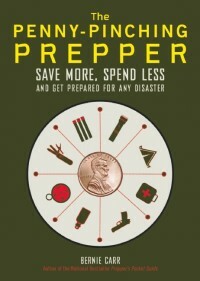 We keep prepper spray as part of our overall defense strategy. We have tiny key chain sprays, as well as bear spray which we purchased for camping. Pepper spray comes with expiration dates because of the likelihood that the nozzle will clog and no longer work when you need it. Because the bear spray canisters are now a couple of years old, and well past expiration, we decided to test whether the spraying mechanism will still work. We also wanted to check how many seconds it takes to un-holster the spray and actually activate the spray if a bear or an attacker were approaching. Mr Apt Prepper and I went out behind our unit on a sunny day to do our test. We made sure there were no other people walking around nearby. The test was done on a day it was not windy – there was an occasional slight breeze but no wind. We checked the direction the breeze was coming from. An average bear can run about 30 miles an hour; while a fast one can run 40 miles an hour. Pepper spray is actually effective if you can spray the bear while it is 40 to 50 feet away, to create a barrier of pepper spray mist between you and the bear. It only takes a few seconds for a rampaging bear to get close and in that time period, the test is to release the safety and press the nozzle to spray before the bear gets within 40 feet. When I first tried it, I was way too slow. The bear would’ve gotten me before I could even position the spray. That was quite a realization, that although you may know how to use the spray, you need to do it fast enough. Next we actually tested that the spray works. Even after two years, the spray was strong and steady. That’s when things got interesting. The slight breeze that we checked earlier changed direction ever so slightly. That small change was enough to disperse some of the spray toward our direction, maybe a drop or two. But these two drops were enough – Mr. Apt Prepper felt his eyes stinging and I felt a sudden urge to start coughing. We quickly ran to the faucet to wash it off. Considering it was only a few drops, there was enough to feel some discomfort. Imagine if you were actually getting attacked outside, and you use the spray while neglecting to check the wind direction. And of course, I should point out I am hardly the expert when it comes to weapons, but do recognize the need for some kind of protection. Just like other weapons, beware and use at your own risk. However, I’m glad we tried this exercise, now I am more mindful of possible pitfalls should I ever have to use it. Good article: Other good advice would be how fast someone could get in their purse, and get the spray can aimed in the correct direction in a panic situation. Hi Kal, That is a good reminder. Thanks for the comment. Great article. Have carried and trusted PS since my department issued it to us over 1 1/2 decades ago. When we were first introduced to it, the ONE requirement to carry was to be sprayed. It sucked. I could work through it but it was very uncomfortable. Have used it on both 2 and 4 legged animals and it will work as long as I hit the target. That is, I aimed for the mouth, nose and eyes. Put a 6’5 drunk down after he grabbed my uniform shirt and told me that he was going to kill me. I always advocate that my girls test their spray every six months and replace when it hits the expiration date. Still trust it but why worry. tpdoldie, I am glad to hear from someone who has used pepper spray effectively, and has been sprayed! (sorry, I am sure it sucked though) Also carry it around with me when walking the dog in unfamiliar trails, in case of animal attack- good to know it’s worked in that regard as well. Thanks for the comment. I forgot to mention that the keychain version, in my opinion are a bad tactical concept. Not enough in the can. I suggest if one is interested in pepper spray, and everyone irregardless of their training, should have PS in their arsenal, to find out where the Police Supply stores are located, go there and buy the size that the cops carry. The Bear size is great, am getting ready to get one for our travel trailer/pickup. Do not leave the can of pepper spray in your vehicles during the summer/Very bad idea, the heat will cause the canister to explode. I remember when we were issued cans/holsters for our duty belts and the old-timers just threw them in their car. A couple of cops could not use their cars for at least two weeks until the chemicals went away. I tell my girls that if they feel the need to have the spray handy, such as walking the dogs, etc. do not have it in your pocket/purse but have it in your hand. In my opinion, after being a cop for almost 4 decades and having used Mace,etc; that the next best thing to sliced bread is Pepper Spray. Hi tpdoldie, That is a great tip about not leaving the canister in your car. I think we will get more of the bear spray size then given the keychain version won’t have enough. Thanks again! Great article to get people thinking about their personal safety plan the tools they can carry for personal protection. I think pepper spray is a great self defense option. Having used both Mace and pepper spray in my law enforcement career and as a trainer for both law enforcement and civilians, I think pepper spray is the better choice. Mace is an irritant and is similar to tear gas and does not work as well, while pepper spray is an inflammatory agent and will almost immediately start to incapacitate an assailant. Having been sprayed more times than I’d like to remember, I can say, it will definitely take the fight out of most people. If you are thinking about carrying or do carry pepper spray for personal protection, I would suggest taking a training class or at less training with inert training canisters. It is much harder to hit your target (eyes, nose and mouth area) under stress (Body Alarm Reaction) and at a moving human being (Action is faster than Reaction). During my classes I have my students first learn the proper technique of discharging an inert training canister at stationary targets. Then we move to drawing the inert canister, removing the safety while moving off line of the attacker and then discharging the unit at moving targets. Then I try and add a little more stress and movement to see how they respond. This builds mind-setting and muscle memory so they have some level of training to fall back on if they are ever attacked or placed in a stressful situation. Remember “Practice Makes Perfect” or at least better then no practice at all. Whatever tool(s) you decide to carry or use for personal protection train with them in the most safe and realistic way you can. Hi CurtL, Great suggestion about taking a training class on the proper use of pepper spray. It was really interesting to find out about reaction times just from our little experiment-you just never know unless you practice. I will have to look into what’s available in my area. I appreciate the comment-thanks! Great Article….I strongly recommend if you are going to carry pepper spray that you train with it. Yes that means getting sprayed and learning how to function. I have been in L.E. for around 14 years. It never fails when you use it you will be wearing it. I would also recommend keeping decontamination wipes with your pepper spray (purse/glovebox/home/etc.). On a side note if you are prepping I suggest simply purchasing wasp/hornet spray. The stream has great distance and would be very effective at disabling an attacker. Its cheaper, more volume, and has a longer shelf life. Just my 2 cents. Hey mrmom, Great suggestion, keeping decontamination wipes-we do not have those yet. Also-great idea on wasp/hornet spray as an alternative. They cost much less-we stocked up on them this spring, as we have a lot of wasps all over the apt balconies and common areas. Thanks for the comment! Recently, I’ve learned about a particular spray gun that, based on reviews, is all the rage. Since I work nights and my girlfriend has to walk the dogs I thought it would be a good investment. Anyways, the model is the Kimber Blaster. This spray gun shoots 13 feet at 90 mph and is a stream and not so much a fog. For us living in a windy coastal town it’s more fitting as there is less chance for her spraying and it coming back into her eyes and not even hitting an assailant. I found it on their website for $50 if I remember correctly. Hey Nick T, Thanks for telling us about this new pepper spray. I’ll have to check it out.